7 Days of co-creation and innovation in Nantong. 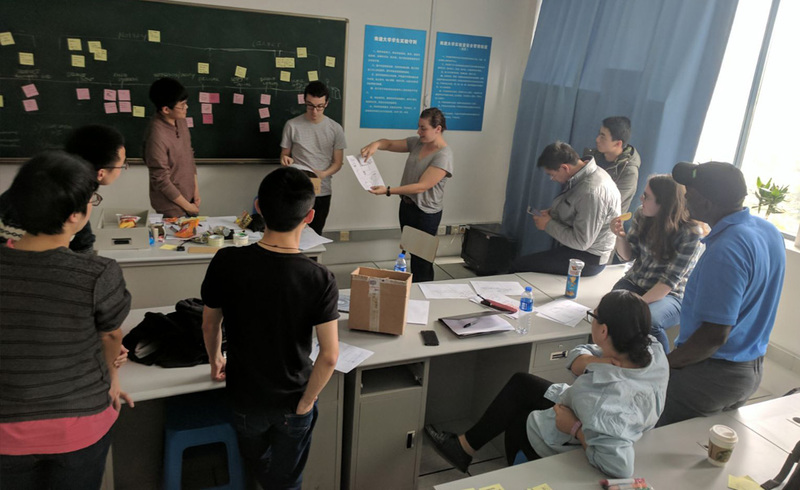 For 7 days in April our global team, working with Innospring, travelled to their partner university in Nantong, China, for an intensive week working with their team to speed their project along. The Innospring team have been tasked with exploring opportunities for developing services for smart buildings in China. Aaron Down, studying his BA Honours with DFM, shares a day in the life of his time there. 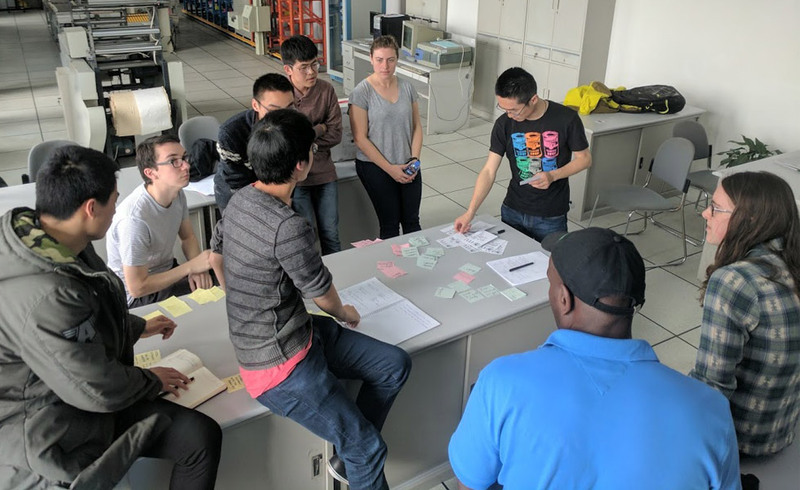 We connected with our industry partner, and team mates from Stanford University and Nantong University, which is two hours out of Shanghai, China, to work on our global innovation project. Although we had some social time with our teammates the focus of this trip was work, and a lot needed to be completed in the time we were there. The clock was ticking and we all knew that in two months we had to deliver our prototype at Expe, so it was time to converge on a direction with our entire team. We needed to examine the value of our ideas and do some user testing with locals in the country the product would be implemented. 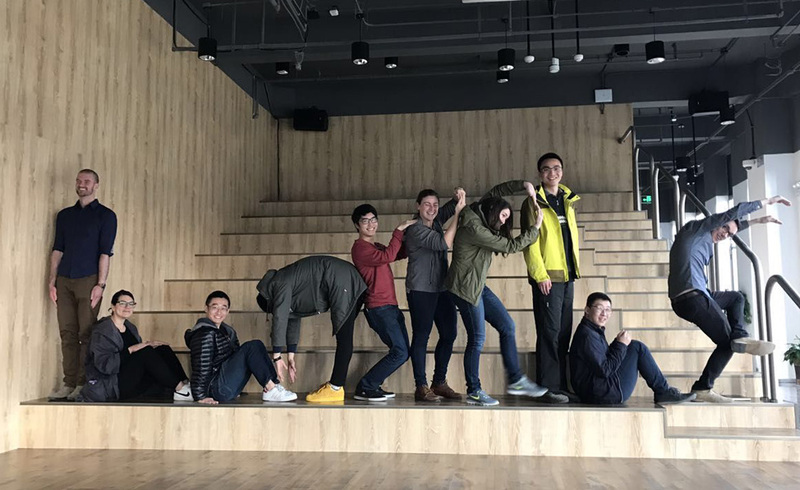 As our teammates in Nantong are engineers and have a different knowledge base to us it was important that we exchanged and shared our different ideas about the process of design research during the trip. 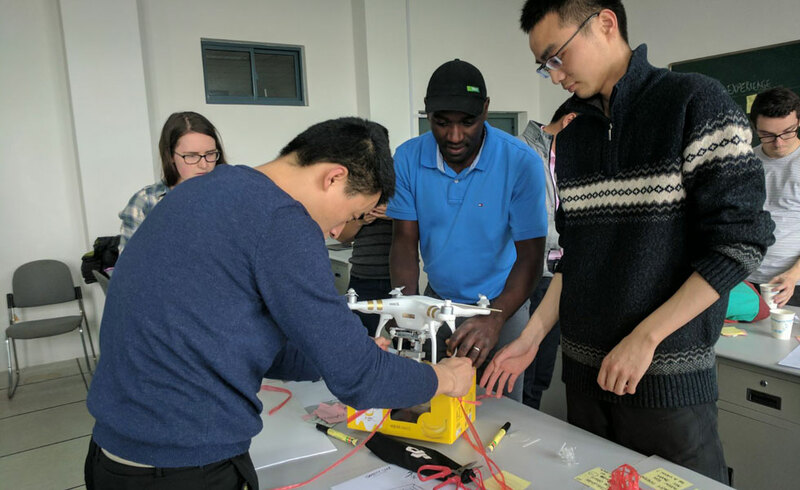 The team breaking down a problem in the Nantong University workshop. ☕ 8:30am – Morning coffee and meet up with Stanford teammates. Walk to Nantong university. We stayed at the same hotel as our Stanford teammates and met at the Starbucks for coffee first thing. It was a really nice walk down to the university because it gave us a rare chance to chat informally about the project and life—getting to know my teammates better like this helped to strengthen the team. The cherry blossoms were blooming and whilst walking in Nantong we could smell interesting and tempting meals from local street vendors. At this time of the morning they were wheeling their carts to the street corners for the day’s trade. Crossing the road in Nantong was an experience! We quickly discovered that the rule seemed to be—just walk and hope for the best… or run for your life. But we managed to arrive safely and met the Nantong students at the university. 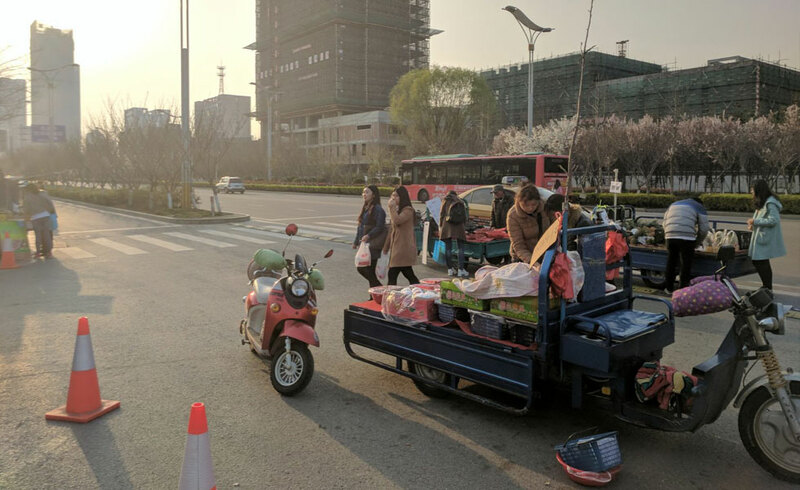 Food vendors and cherry blossoms on the streets of Nantong. ?9:00am – Begin the morning with a Chinese government mandated calisthenics routine. This was put on for us as a part of Chinese culture and sometimes the local students in our team joined us. Once upon a time this was compulsory for all students. We followed instructions from a big projector. The exercises were full of aerobic things, like stretches and star-jumps. It is hard to get ten people together to share opinions and make sure everybody is heard in a productive discussion. So we broke into mini teams and took a section of the problem each. We then came back together to present what we discussed so everybody was on the same page as we went forward. On the first day we were taken to eat a delicious seven course private meal with local seafood delicacies. It was at a restaurant on campus that was adjacent to the cafeteria with special rooms for guests. We soon found out that it didn’t cater to local students so we couldn’t eat with the local students on our team. This felt strange for us so after the first day we tended to eat at the cafeteria. It didn’t quite compare to the delicious food at the restaurant but at least we ate as a team! Prepping for afternoon presentations to the industry partners. We had a meeting at the start of the week with our industry partner, Innospring. 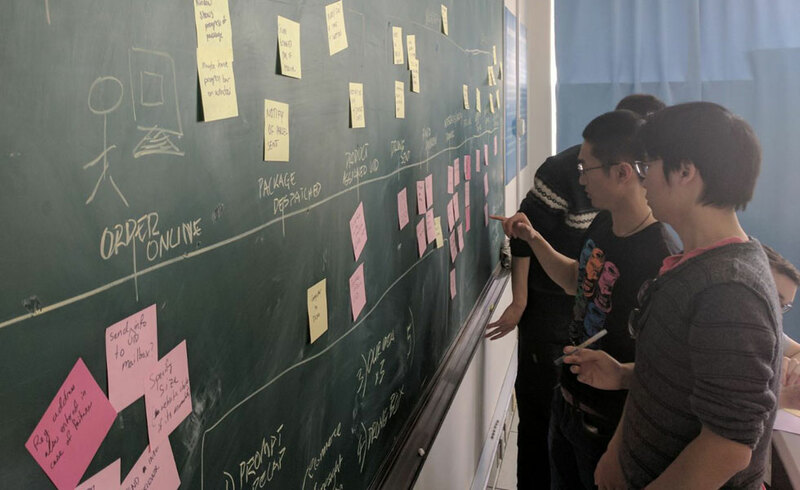 This was an opportunity for Innospring to give us feedback on our previous prototypes and project directions, as well as for us to gather insights and clues to a future direction. Preparation for the presentation put our communication skills to the test as we had only just converged our ideas that morning. Experiences in presenting during previous classes really helped with this. This was a really fun meeting because we had built a good relationship with our industry partners during previous visits and they were very excited that we were visiting. It was a small informal group meeting, with idea’s flying around and good feedback. We left with some important considerations for our future designs. Almost the end of the day! We sat down as a group and took time to debrief and pack up for the day. As we left for dinner with a clear agenda defined for the following day. 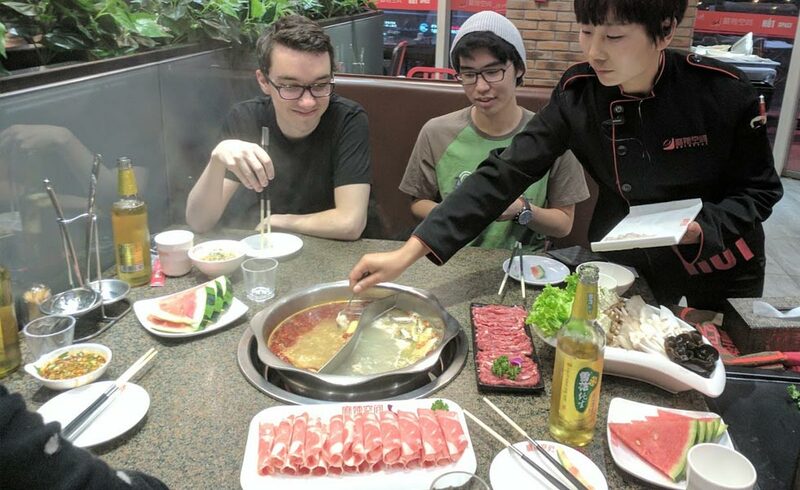 We headed to a local hot pot restaurant for an amazing dinner together. It was complete with matching aprons, dancing noodles and a Chinese opera performance. It was so much fun and everybody was in a great mood. Much like the walk in the morning, this was another great opportunity to get to know each other outside of the project. Everybody was happy about what we had achieved that day and this was a great way to celebrate the day’s hard work.
? 9:30pm- rest, recover and repeat! The DFM Global Program—the 10 most intense, life changing months of my degree.